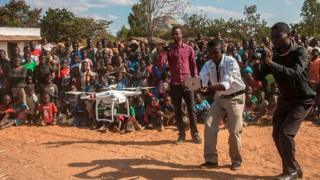 Unicef says its projects adhere to a strict set of innovation principles and it is committed to sharing its knowledge with the fledging drone community. It says that the project was launched after a successful test flight last year to deliver dried blood for early infant diagnosis of HIV in hospitals in Malawi. The organisation also used camera-equipped drones to assess the needs of people cut off during a flood. "With UAVs we can easily fly over the affected area and see clearly what the impact has been on the ground. This is cheaper and better resolution than satellite images." • The corridor will run for 1-2 years. For drone enthusiasts and campaigners, this development is another important step in the right direction. After years of opposing the commercial and civilian use of drones, African governments are slowly allowing the integration of UAVs in the airspace. The Malawi air corridor project is a close copy of an idea proposed to the Kenyan government by a Swiss polytechnic about four years ago to operate a drone delivery service called Flying Donkey. The plan was to operate fixed-wing drones, carrying a payload of up to 20 kg (44lbs), in sparsely populated and infrastructure poor northern Kenya to supplement the postal services. While there are legitimate concerns about privacy and safety, the absence of progressive drone laws to regulate the industry means African countries have been missing out on the multi-billion dollar industry. Malawi now joins Rwanda, South Africa and Mauritius on the list of countries leading cutting-edge research on drone use to address real-life challenges. Video Drones - good or bad for Africa?